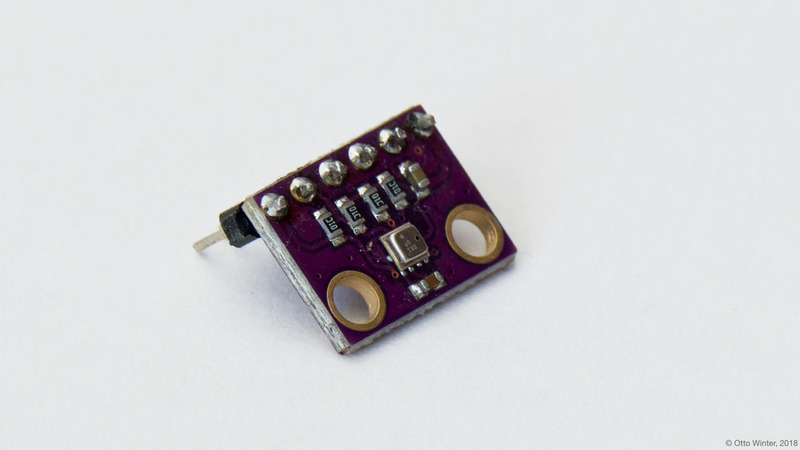 The BME280 Temperature+Pressure+Humidity Sensor is a simple temperature, humidity, and pressure sensor with communication over I2C. With some simple math it is possible to either determine the height of the sensor, or the current pressure at sea level. This guide can be applied to any sensor measuring temperature and pressure at the same time, like the BMP280 Temperature+Pressure Sensor, or BME680 Temperature+Pressure+Humidity+Gas Sensor. The first step is to connect the sensor as described here. After validating the sensor is working, we can proceed and add some formulas. The first block sensor starts with the normal bme280 sensor components temperature, pressure, and humidity with each their own id. After the bme280 sensor, a Template Sensor is defined to calculate the altitude in a lambda. The variable STANDARD_SEA_LEVEL_PRESSURE (in hPa), should be filled in for your location. The formula derived from here, converts the currently measured pressure to the altitudes in meters including temperature compensation. The lambda in the second Template Sensor defines two physical constants and converts the currently measured pressure to absolute humidity (grams/m^3). Calculating the altitude with the BME280 sensor accurately requires this value to be known at sea level for your location and day. This can be achieved by replacing the global constant STANDARD_SEA_LEVEL_PRESSURE by for example pulling this value live from the internet or a stationary sensor via MQTT. Calculating the sea level pressure with a statically mounted sensor can be be used as reference for moving sensors as mentioned in the note above. name: "Equivalent sea level pressure"
For calculating the equivalent sea level pressure, the sensor needs to be mounted at a fixed altitude. Therefore it is not possible to calculate altitude at the same time, and vice versa!